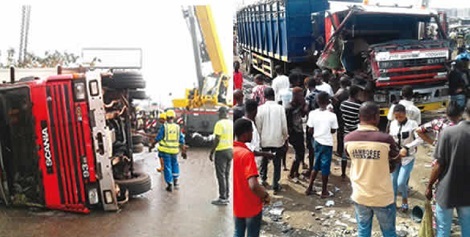 No fewer than nine persons lost their lives on Thursday to a road accident at the Kara end of the Lagos-Ibadan Expressway, Ogun State, and a train crash in the Fagba area of Lagos State. While the Kara incident was a multiple accident involving 16 vehicles, the Lagos crash involved a train which rammed into a truck. Five fatalities were said to have been recorded in the road crash, while four persons, who hanged on the front side of the train, were crushed to death. Over 20 persons sustained injuries and were rushed to different hospitals in both accidents. A truck driver, who was involved in the Ogun road crash, said he escaped unhurt after jumping into a bush before his vehicle plunged into a canal under the Kara bridge. Punch Metro learnt that a diesel-laden truck had spilled some of its content while plying on the expressway outwards Lagos. It left without any incident. Shortly afterwards, another speeding truck reportedly slipped and rammed into a bus when the truck driver slammed on the brakes. It was learnt that 14 oncoming vehicles, including a bus conveying a large number of bananas, crashed into one another in quick succession. The crashes, which occured around 6am, caused a traffic jam on the expressway and extended inwards Lagos, including Ojota and Ogba areas. One of the survivors, who identified himself only as Abubakar, a truck driver, said he was heading for Ibadan, Oyo State, when he ran into the multiple crashes. The Kano State indigene said, “It just finished raining that time and the road was wet. On getting to Kara, I suddenly ran into the accident and applied the brakes. When I discovered the truck was falling into the canal, I jumped into the bush. At the Lagos State Accident and Emergency Centre at Toll gate, Ojota, where some of the victims were rushed to, a nurse told Punch correspondent that they had been stabilised and referred to the Gbagada and Ikeja general hospitals. She declined further comments on the victims. The FRSC Sector Commander, Clement Oladele, and the LASEMA General Manager, Tiamiyu Adesina, said five persons were killed while 19 others were injured. Oladele said, “Vehicles involved in the crashes were a white Nissan bus, BDG27AA; two Daf trucks with number plates GGE818XC and APP769XR respectively; a blue Nissan Cabstar, XS216KSF; two Honda cars, with number plates MUS411DG and APP303DV; a Mazda bus, AKD520XN; a Ford bus, KTU340XU; a Lexus Jeep, FKJ475BR; a MAN truck, AGL545XF; a MACK truck, BDG561XG; three Sino trucks with number plates, KRD122XC, AGL197XD and KRD123XC respectively; a Volkswagen bus, KTU594XM and a DAF truck without a number plate. In the Lagos train crash, Punch correspondent learnt that the truck driver had just offloaded some cattle at Abattoir – some distance away from Fagba – and wanted to make a U-turn on the railway track when the incident happened. A police source said the driver fled from the scene and abandoned the truck with number plate, MYM 63XA, as the train was fast approaching. An eyewitness, Emeka Godwin, told Punch Metro that N16,500 was found on one of the deceased. The LASEMA boss, Tiamiyu, said the Lagos State Ambulance Service treated the injured persons, while the bodies of the deceased were deposited in a mortuary. He advised motorists to always adhere to road safety rules and regulations and urged people who were in the habit of hanging on moving trains and vehicles to desist from the act.